It is probably best to mention this first. It is about an almost trivial and quite annoying issue. Bone: Out from Boneville is an incredibly short game. Here, I said it. The game is almost amateur-adventure length, and everything you have heard about the duration of the game is true. The developers promise a meager sounding 4 to 6 gameplay hours, but it is actually shorter than that, and even they seem to have acknowledged the problem. To be frank (despite my fondness of Telltale) you will be hard pressed to squeeze more than 3 hours out of Bone: Out from Boneville, and that is, only if you explore everything and exhaust every dialog option. You could evidently rush through the whole game in just a little over an hour, but such course of action does sound rather silly. Admittedly, the Telltale team, the publishers of Bone and ex-LucasArts maestros, has shown that they value gamer feedback by constantly releasing updated versions and demos. They are also the people who will bring us the new Sam and Max game. So, yes, paying $20 for a two hour game you have to download from a Web site is quite steep. More of a rip-off than your average video game actually, but one must admit that keeping Telltale alive can be an almost noble cause. Besides, the second Bone game entitled The Great Cow Race is just around the corner, and will supposedly be a much longer and more polished effort. But enough with the length issues! You wouldn’t judge a book by the number of its pages, would you? Before you answer, please, do think about Edgar Allen Poe’s writings. It is time for a more or less proper review of Bone: Out from Boneville (henceforth just Bone). 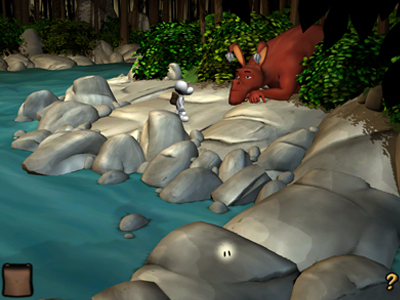 Bone follows the story of three strange bone-colored, vaguely bone-shaped and apparently Bone-named creatures that get lost in a strange and quite fantastical valley, aptly named the Valley. 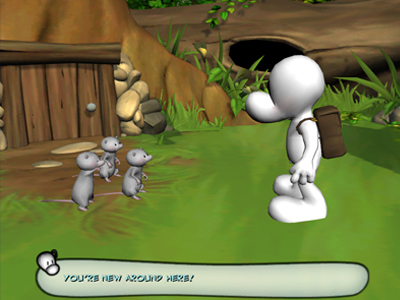 It does sound quite bland, but the world of Bone – envisioned by the charismatic Jeff Smith, who was also involved with the creation of this game – is charming, amazing, funny and deserving many more adjectives of the kind. Out from Boneville, the comic book, has sold over 100,000 copies, and with good reason. The story might indeed start off slowly in the first episode, but it quickly picks up the pace and reaches epic proportions, without ever loosing its goodhearted sense of humor. 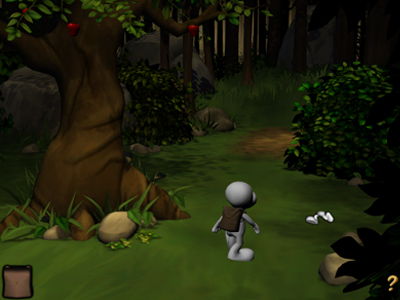 At certain points Bone can almost feel like a Disney tale, but it is much better than that. Believe me, even if Smith’s work does come with a warm and fuzzy feeling, it is more like Asterix than Mickey Mouse. Mind you, the entire Bone epic spans more than 1000 pages. The game closely follows the comic in terms of story, even though some inconsistencies can be found. One of them, a certain meeting of certain people with a certain fantastical beast, is quite a major divergence. On the other hand, I believe Jeff Smith must have been aware of the changes, and perhaps authorized them, taking into consideration the new interactive medium. The plot, in both game and comic, starts innocently enough. Three cousins named Fone, Phoney and Smiley, the three aforementioned Bone-creatures, get kicked out of Boneville, their appropriately name hometown. They proceed to get hopelessly lost and entangled in humorous Tolkienesque events. This being the first Bone episode –I did mention Bone games are episodic didn’t I? (well, I should have) – is more of an introduction. You will get to acquire a lot of back-story information and key characters will be established. You won’t actually experience a major portion of the excellent saga, but you will be able to value its worth. You will also meet Grandma Ben, Thorn, the almost-evil Rat creatures, and my favorite character the great Red Dragon himself. Bone, apart from sporting an excellent story, is also a mildly innovative game, something I consider a wise move. It is an evolution of 3rd person point and click adventures, but not in the sense that the (awesome, beautiful, grand, etc) Grim Fandango was. It’ more of a Maniac Mansion to Day of the Tentacle evolution. The 3D engine and the simplified point and click interface (the icon changes over each hotspot accordingly and automatically) are a step forward and create the possibility of actual cinematic direction and storytelling while still maintaining a look and feel similar to Monkey Island – which definitely is a good thing. The built-in hint system is a great idea, sleekly implemented, and to be rather frank a generally needed addition. Having initially subtle and progressively more explicit hints provided for you saves the trouble of exiting the game and surfing the net for a walkthrough, which in our conformist times is readily available. A tutorial for people who have never played an adventure game is also included. Another interesting innovation is the new dialog system that gives you the possibility to fluidly and intuitively engage in (surreal) conversations with more than one character at a time. 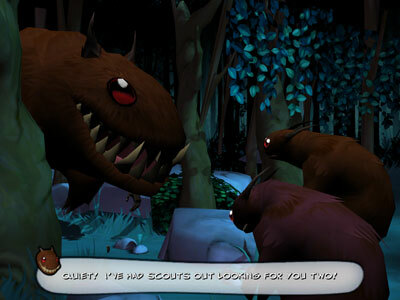 And speaking of surrealism, you’ll meet quiche-eating monsters and engage a giant leaf-like bug in a captivating chat. Instead of trying to revolutionize the adventure genre, Telltale has tried to create a really good adventure game by sticking to the roots. You will progress through the linear plot through puzzles, mini games, a little inventory manipulation, and dialogs. Everything is an organic part of the ongoing story and even though puzzles are on the easy side, they are quite rewarding and well implemented. 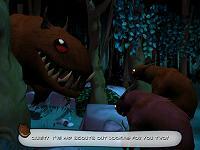 The only problem seems to appear in some arcade sequences, like the Rat creature chase, where – despite the newer versions and patches – serious game play problems and bugs are encountered. In a short game like Bone, the fact that the two almost identical chase sequences exist does not bode well either. Thankfully, in version 1.5 of Bone, you can bypass the scene (and every other arcade section). 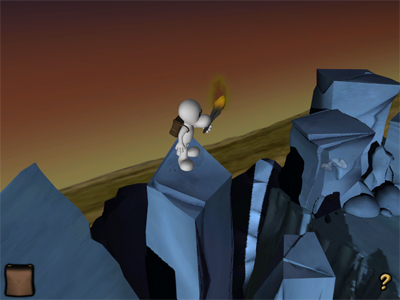 Puzzles and mini-games do tend to change in tone and logic, according to whom you control. 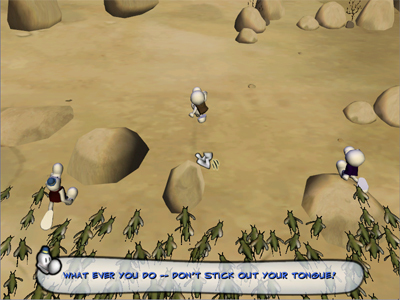 Fone Bone will sweet-talk his way out, while Phoney Bone might just insult the wrong person (or bug). 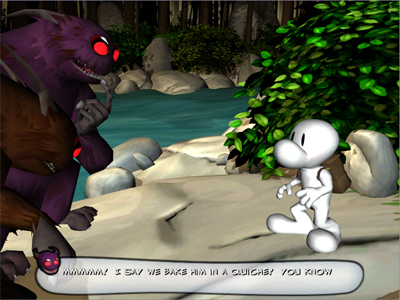 Smiley, the third Bone cousin, isn’t a playable character. Unfortunately, Phoney’s reversed hide and seek puzzle is tedious, illogical, and boring, despite originally sounding like an interesting idea. Reviewing Bone, as you may have already gathered, is more of an exercise in dialectics than an ordinary game review. At one point you love it, at another you find it disappointing, and you always believe it will evolve by overcoming its contradictions. 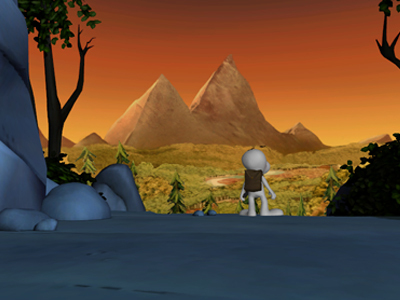 The 3D engine is nice and allows for cinematic panning, cuts, and close-ups, but the scenery is mostly empty and not so interactive. The dialogue quality is excellent, even though sometimes directly lifted from the comic. The dialog system itself is has a simple and elegant idea concept, but the dialog trees are a bit clumsy, repetitive, and not as fluid as they should have been. The soundtrack is one of the best ever released and the voice acting is above average, but the whole cinematic feeling is marred by a few horrible 3D models. Thorn in particular, instead of a beautiful young girl, tends to look more like a blocky unshaded poser-created zombie, wearing a metal blondish wig. To be fair, the Bone cousins’ models with their expressive eyebrows, as well as the extra-cute Possum kids, and the Great Red Dragon (despite missing his cigarette) are lovely. However, for every little thing that shows a loving attention to detail, there is another that reveals the game was rushed. You have a very nice save system, and then you can’t have Fone Bone run. You have well-designed character close-ups, but mediocre lip-synching. And there is no Winter coming to the Valley, which might be irrelevant to most (? ), but fans of the graphic novels will definitely miss it. To be fair, as well as frank, really good looking, well educated, with a huge car, and with olympic level athletic skills, I must admit that Bone is an overall great game. The game is being published by its original creators, and not through a huge multinational corporation. This accounts for many of Bone’s limitations, which Telltale seems to be slowly overcoming. Who knows? We could be witnessing the birth of the first truly important independent game developer. The future will tell. Buy Bone. Bye.